Does your office have days like this? Most businesses do, and it’s that point when you recognize you need to focus on your business and let the experts manage your technology. That’s where Nocserv IT Department in the Cloud comes in. We provide complete Turnkey Outsourced IT services at a predictable monthly cost that doesn’t break the bank but ensures your business stays up and running and your staff stays productive. To introduce you to Nocserv, we will give you a $5,000 IT and Cyber Security Assessment for Free. This will include detailed information about your IT environment from which we can confidently make recommendations that will help you take IT from a burden to a business advantage. To get your free assessment call us at 713-524-1800 or register on our website at www.nocserv.com/getstarted. 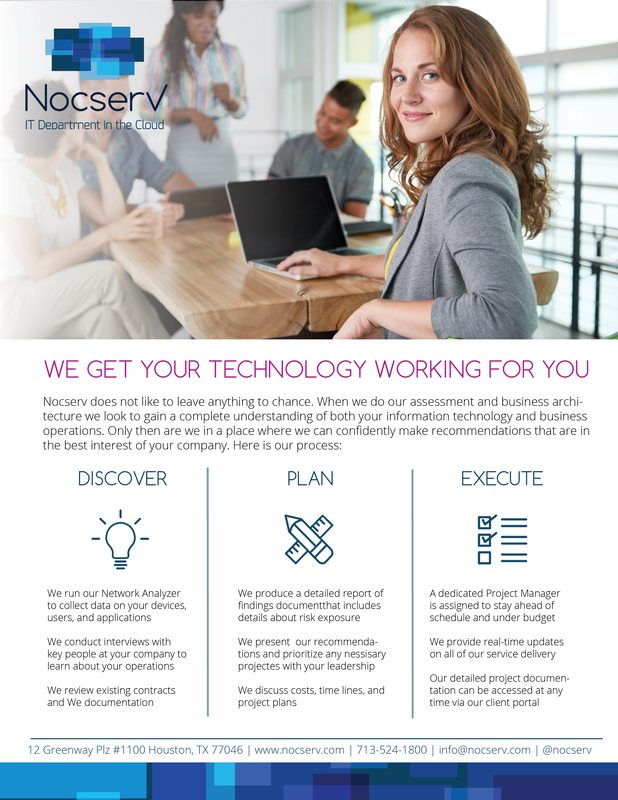 Nocserv is ready to be your IT Department in the Cloud.